Of all the corporate logos that tower above downtown Los Angeles, the block letters spelling out “EASTERN” above the corner of Ninth and Broadway might be the most elegant: white, sans-serif characters set against turquoise terra-cotta, illuminated at night in neon. They might also constitute the only defunct logo to crown a downtown skyscraper—Eastern Outfitting went out of business in 1957. Though Eastern would later construct what’s arguably downtown’s most beautiful Art Deco building, the company first opened in Los Angeles as a modest one-story clock shop at Sixth and Spring. The proprietor of the Eastern Clock Co., as it was then called, was a 16-year-old Polish immigrant named Adolph Sieroty, who soon grew the business into a diversified retailer of home furnishings, appliances, and apparel in addition to timepieces. Sieroty also pioneered a credit purchase program that let customers pay for large acquisitions over time through small weekly payments. In 1912 Eastern spun off its successful apparel business, Columbia Outfitting, and by 1929 the two companies—with Sieroty at the helm of Southern California operations for both—operated 39 retail branches. It was an achievement that seemed to call out for a grand structure, a flagship location along Broadway’s bustling shopping corridor. To design it, Sieroty turned to architect Claud Beelman. Beelman gave him a masterpiece. Clad in turquoise and gold terra-cotta and trimmed in copper and gold leaf, the thirteen-story Eastern Columbia Building announced itself in a central business district of tan and beige when it opened on September 12, 1930. Eastern Outfitting and Columbia Outfitting (which merged in 1939 to form Eastern Columbia, Inc.) shared the building, with showrooms on the ground, basement, and mezzanine levels and offices and service departments above. In consultation with engineer R. M. Storms, Beelman placed the building’s boiler, fans, and other machinery—usually hidden in the basement—in a two-story penthouse, which he crowned with a Telechron electric clock and Eastern’s name spelled out in neon letters some 235 feet above the street. The Eastern name still glows today, long after Sieroty’s company furnished its last living room. 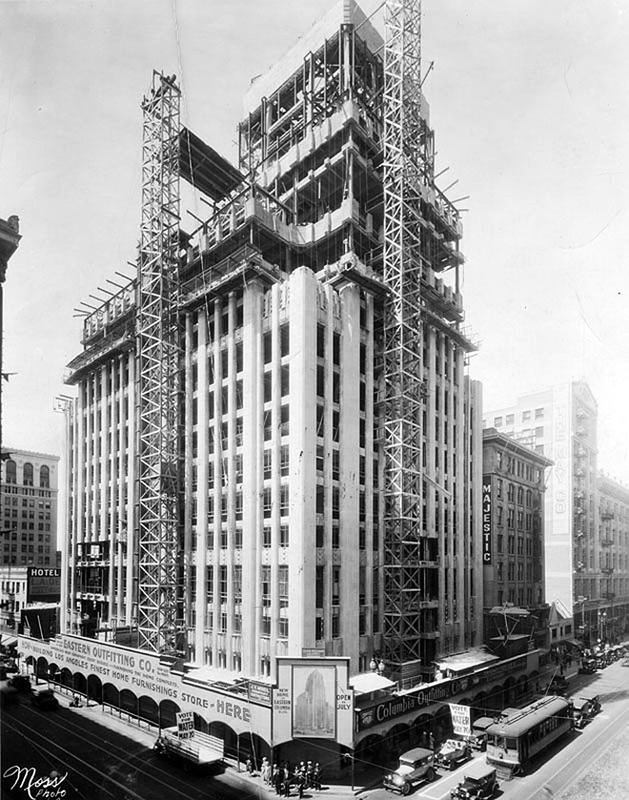 Above: The Eastern Columbia Building under construction in 1930. Courtesy of the Photo Collection – Los Angeles Public Library. These Teal Art Deco Towers Are Among the Most Beautiful Buildings in L.A.